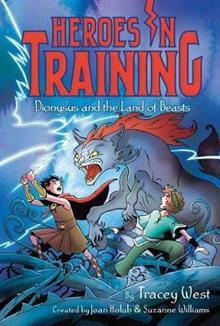 Zeus and his friends discover another Olympian who might be able to help in their quest to defeat King Cronus in this Heroes in Training adventure. With a clue from their trusty oracle, Pythia, Zeus and his Olympian friends are off to the Land of Grapes, where they discover a festival. The headline act is Dion and the Goat Guys, and Zeus has a funny feeling this Dion guy might be one of them. Athena points out that this Dion guy is the right age, and he's definitely not acting like a regular kid. Finally, Dion and the Goat Guys take a break, and Zeus and the other Olympians approach him. Zeus informs him that he and the others are Olympians, and they think Dion might be one too. Dion (short for Dionysus, he tells them) starts to brag that he wouldn't be surprised, because he has awesome talents and magic powers. Before the Olympians can ask him about his powers, some of the crowd members start to throng the Olympians. Are they really Olympians? Are they really going to defeat King Cronus? Dion looks kind of peeved about this, and the next thing the Olympians know, they are in a field somewhere, puzzled and not sure what happened. What kind of magical powers does this Dion kid actually have? And will he be more of a help--or a pain--in their ultimate quest to defeat King Cronus once and for all?